The British Journal of Ophthalmology (BJO) has disseminated the BMF’s clinical study as part of the EYE-RISK European project to identify ocular phenotypes in patients with geographic atrophy (GA). The research characterises three types of GA, one of which describes a particularly slow growth pattern. The characteristics studied have proved to be important for the prognosis of the condition. They have also helped to establish both the eligibility of those affected in clinical studies and phenotype-genotype correlations. The study was conducted by monitoring patients with GA (the most advanced type of atrophic AMD) over an average of 1.5 years. The methodology of cluster analysis was used to identify sub-groups among the population studied, based on the presence of certain fundus characteristics, such soft drusen or reticular pseudodrusen (RPD), primary foveal atrophy or elevated fundus autofluorescence, among others. Image: Examples of phenotypes. 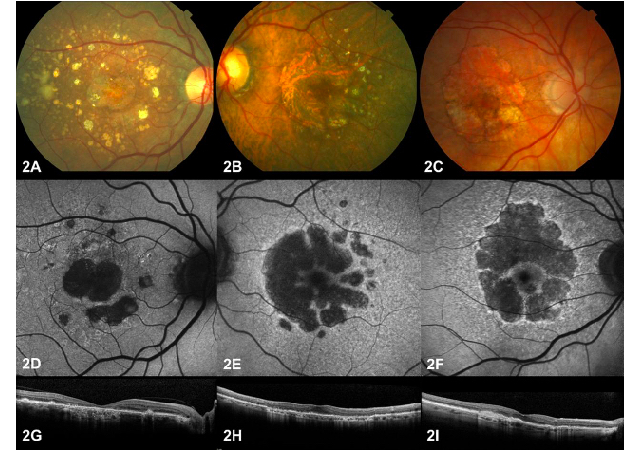 Representative fundus photographs (A–C), FAF (D–F) and spectral domain optical coherence tomography (G–I) images from phenotypes 1 (first column), 2 (second column) and 3 (third column). Phenotype 1, with slow growth, is characterised by foveal atrophy and a high soft drusen load, whereas phenotype 3 showed a high reticular pseudodrusen load, a perifoveal area of atrophy with increased FAF and a thin subfoveal choroidal thickness. Phenotype 2 presented intermediate features between phenotypes 1 and 3. FAF, fundus autofluorescence.